An operation to remove the trucks, hanging over the River Ouse, has started. 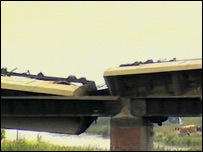 A clean-up operation is under way after a freight train derailed on a bridge crossing in Cambridgeshire. Two trucks carrying ballast were left dangling over the River Ouse, between Ely and Soham, following the derailment on Thursday night. A spokesman for Network Rail said the first part of the train had been removed overnight and access roads to the track were being put in place. No one was hurt in the incident and the line was closed for an investigation. Although the rail line is mostly used by freight trains, passenger services from Peterborough to London will be affected, a One Railway spokesman said. Rail passengers between London Liverpool Street and Peterborough will have a bus replacement service between Ely and Bury St Edmunds over the next two weeks, with delays of up to an hour expected. The train involved was travelling from Mountsorrel in Leicestershire to Chelmsford in Essex carrying aggregates. Officials from the Rail Accident Investigation Branch (RAIB) are at the scene.